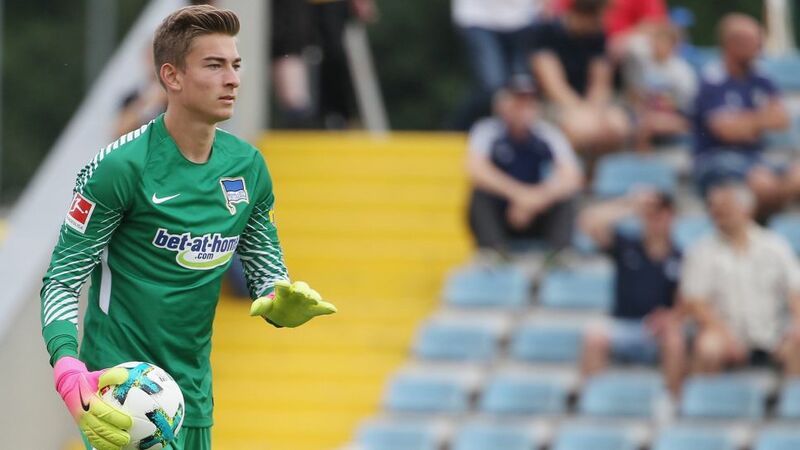 Jonathan Klinsmann will make his senior debut for Hertha Berlin on Thursday in the club's final UEFA Europa League Group J encounter against Östersunds FK (kick-off 21:05 CET/20:05 GMT). Hertha coach Pal Dardai confirmed that the goalkeeper will start during his pre-match press conference on Wednesday: "[Goalkeeping coach] Zsolt Petry decides who plays in goal and he has convinced me. Klinsmann has continued to develop and has shown great body language. We can put him to the test tomorrow. Thomas Kraft is ill and Rune Jarstein will not be available. Jonathan will play in goal." The 20-year-old son of former Bayern Munich striker and USA head coach Jürgen Klinsmann joined the club over the summer following an impressive showing for the USA at the FIFA U-20 World Cup in South Korea, but had a difficult start to life in the German capital after suffering an ankle injury in August. Currently the club's third-choice goalkeeper behind Jarstein and Kraft, Klinsmann has so far only played in the club's reserve side in the lower divisions of German football. Hertha can no longer reach the Europa League round of 32, as they sit bottom of the Group J table with four points from five games so far. However, Östersunds will be motivated going into the clash at the Olympiastadion, with the chance to seal top spot in the standings ahead of Athletic Bilbao.